Jump the Devil is a work of fiction, a novella, narrated by interrelated characters in seriously dysfunctional relationships. The mostly internal narratives are by ex-peacekeeper soldiers with secrets, corrupt doctors, angry old men and women, abusers, a young woman trying to break free from her family’s restrictive expectations and religion. None of the narrators are all-clean or all-good. Many of them are obsessive about something—whether philandering, locking one’s husband in the basement, journalling, hating, daughter jealousy, preying on local women, skin bags of ears, social status, class, brand fashion status, etcetera. Their stories weave together like lines of traffic, or convoys on ruble-strewn streets moving too fast for their safety. The reader feels the roller-coaster hurtle of the narrators in their stories. 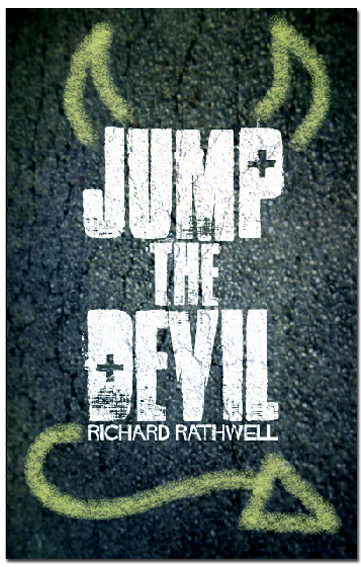 Rathwell writes an engaging and convincing prose set in the tumultuous world around us. Some the book is set in part in England—where Rathwell lives—but it could be anywhere “Western”. It is also set in Central Africa and Egypt—with every place feeling disorientating and troubling to the various narrators—foreign to their upbringing—with swirling undercurrents of racial tension, hostility, and confusion. There is palpable violence throughout the book—with possible suicide vests, alleged past roles in massacres, so-called democratic uprisings, colonists, insurrectionists, rapists, terrorists, redemptionists, and revolutionaries engaged in war, genocide, revenge, rebellion, and fights for freedom nationally and personally. The reader or, as Ted Hughes put it, the "coauthor" is challenged by these labels/identities and where one stands in relation to other people and events in the world. With their own assumptions and ignorance, the reader is left haunted without ability to conclude these increasingly unresolved stories. 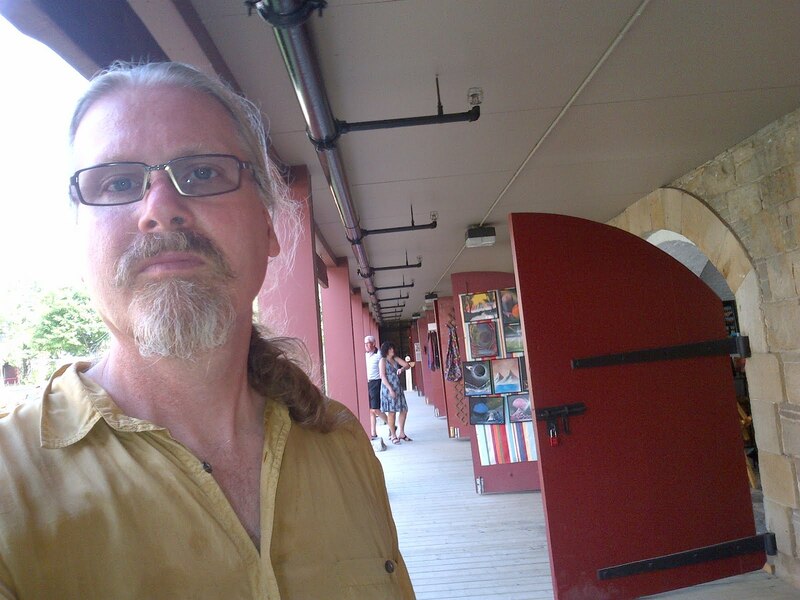 —Joe Blades is the award-winning producer–host of Ashes, Paper, & Beans broadcast weekly, since 1995, on CHSR 97.9 FM in Fredericton, NB. He is an artist, educator, and writer with seven published poetry collections—three of which have also been translated and published in Serbia and Bosnia Herzegovina. 2012-11-18 Odd Sundays at Molly's reading featuring a short story, "Drugged", by Kellie Underhill (Miramichi, NB) & poetry by Emily Skov-Neilsen (Saint John, NB). 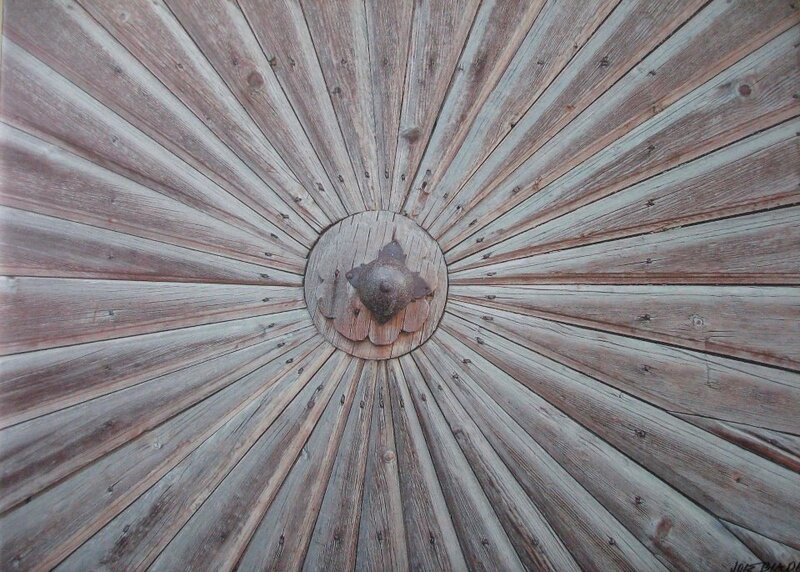 Recorded by Joe Blades, Fredericton, NB. Neil Simpson: "The Other Yellow Bird"
Diane Reid: "Summer Preserves", and "Daughter"
Noah Richler: Is Canadian Multilateralism Dead? (The 12th Annual Dominick S. Graham Lecture in War and Society, The Gregg Centre for the Study of War & Society, UNB, 14 Nov 2012). Introductions by Mark Milner and Suzanne Alexander. Recorded by Joe Blades. 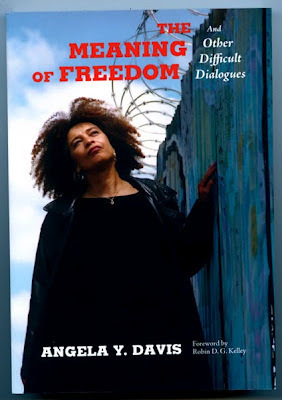 An essay of mine, "Publishing Nela Rio in Canada", is included in this new eBook all about Fredericton author Nela Rio and her writings both poetry and fiction. The eBook was launched November 2012 in Toronto, Ontario. Mine is the only contribution in English in this mostly in Spanish publication. 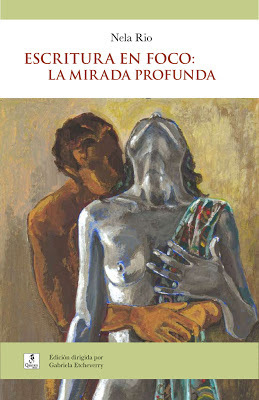 The book came out of a conference on Nela Rio's work that I prepared for but was unable to attend: del Segundo Simposio de la serie Autores hispanocanadienses organizado por la Red Cultural Hispánica, que celebramos el 15 de mayo de 2008 la obra de la poeta, escritora, artista, investigadora y promotora cultural Nela Rio, en la sede de la Universidad Nacional Autónoma de México (UNAM), Gatineau QC. There's a link below to the eBook PDF. For years, since the late 1980s, I have recognized 1 Dec as Day Without Art as a day of action and mourning in response to the AIDS crisis. Like many other things it seems the day's approach changed, in 1997, and those changes finally caught up with me. 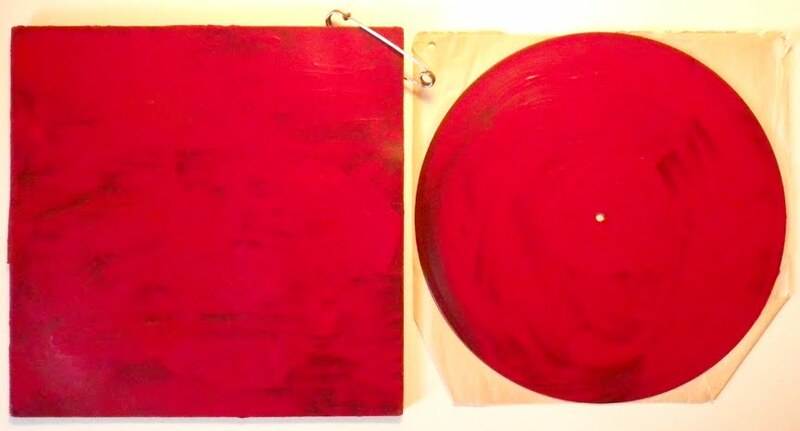 "red album + red square" (acrylic on mixed media, 2012) is my contribution, made this week, to the Charlotte Street Arts Centre's Day With(out) Art Event/Exhibition of works created by volunteer artists from their ArtReach program. According to artist WhiteFeather, "Artists will select a pre-existing artwork (painting, cross-stitch, etc—something that can hang on a wall) and paint the entire thing over with red paint. Many abandoned artworks can be purchased for extremely cheap [...]. The idea is to completely ‘red-wash’ the pre-existing work, in order to support the theme of Day Without Art, while raising awareness for AIDSNB, using the colour that symbolizes the AIDS awareness movement. The results will be red works with enhanced texture, that will show the ghost of the original underneath. Conceptually, this also ties in with the theme of loss due to AIDS, as well as the idea of funding cuts to the arts/health and the disappearance of art." To that I add recognition and support for the Québec student movement. The exhibit will be in the Charlotte Street Arts Centre's Galerie Penny Gallery, 732 Charlotte Street, Fredericton, NB, in Dec 2012 (and possibly longer). Yves Engler, author of The Ugly Canadian: Stephen Harper's Foreign Policy (Fernwood Books), talk at St Thomas University on 18 Nov 2012. Recorded by Joe Blades. Lone Cloud: Teresa Marshall poem "Is That Too Much?" John Ashbury: Woodbury Poetry Room reading 1963. Brian Carpenter @ Chapterhouse, Philidelphia, PA, 9-13-08. Poet Erin Mouré on Charles Bernstein's Close Listening, 2-21-10.
odd sundays at molly’s, Fredericton’s longest-running, semi-monthly, poetry-reading series, taking place this coming Sunday afternoon, with writer Kellie Underhill from Miramichi, and poet Emily Skov-Nielsen, from Saint John. Joe Blades will be emceeing the event, and all are welcome. KELLIE UNDERHILL has been the Editor of Bread 'n Molasses magazine since its inception in 2003. She studied Journalism at Ryerson University in Toronto, ON with a particular focus on newspaper copy editing and worked as a freelance journalist for several years with her work appearing in The Miramichi Leader, The Moncton Times-Transcript, The Brunswick Business Journal, The Atlantic Chamber Journal and The Reader magazine. During her time as a freelancer, she also did public relations writing for clients including the New Brunswick Community College in Miramichi. 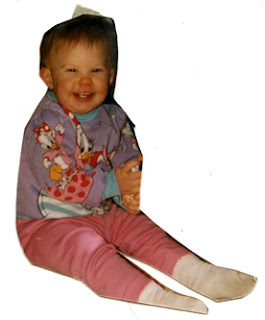 EMILY SKOV-NIELSEN is a recent UNB graduate living in Saint John, New Brunswick. 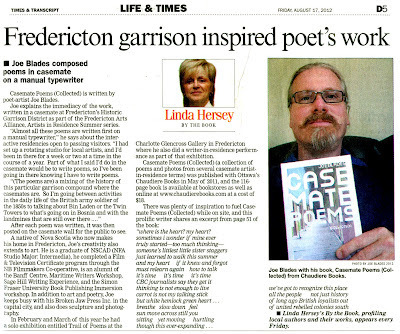 She has given a number of poetry readings in-and-around Saint John and has had work published in The Antigonish Review. She was also this year's recipient of the Dr. Anne Compton Creative Writing Prize in Poetry. Recently she has returned from an intensive week-long writers' retreat where she had the pleasure and privilege of working with poet, Don McKay. Bring your ears; bring your literary sensibilities; bring three minutes of your own writing for the open set. hope to see you at the next odd sundays event, December 2, with THREE great readers (alphabetically): Joan Clark, and Jane Tims. 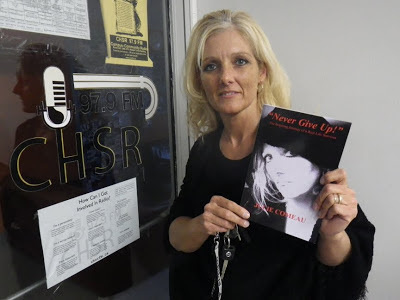 November 15, 2012, at 7 pm Julie Comeau will launch her book "Never Give Up!" 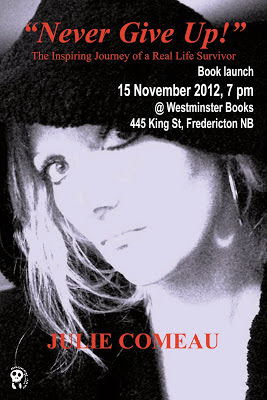 The Inspiring Journey of a Real Life Survivor (Broken Jaw Press) at Westminster Books, 445 King St, Fredericton, NB. 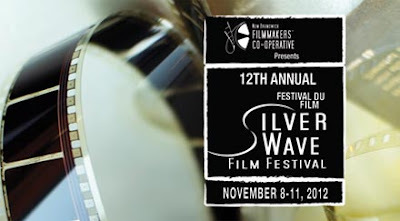 Live interview with New Brunswick filmmakers Bunthivy Nou and Tim Rayne about their filmwork and involvement in this year's Silver Wave Film Festival. Live interview with Jillian Ackerman and Ryan Griffth about their films in this year's Silver Wave Film Festival. Zorras: "Nest", "In the Details", & "If"
Cory Redekop: reading an excerpt from Husk (ECW Press). Andrea Gibson: For Eli. Profit. I Do. Wells. Rush Hour. See Through. 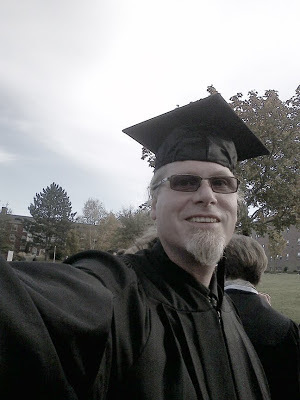 Queued in the parade of graduates before we walked to the Currie shop for presentation of diplomas where I received my Master of Education. Patricia Smith: "Spinning Till You Get Dizzy"
Live interview with Julie Comeau, Fredericton author of "Never Give Up!" The Inspiring Journey of a Real Life Survivor and Jim Lavoie, publicist. 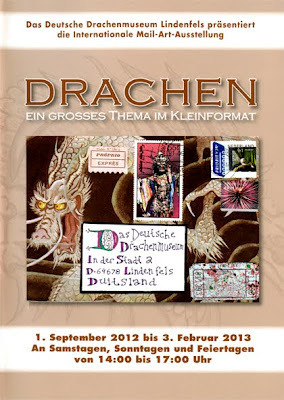 Christopher Stewart: "Beat the Drum"
Drachen is a group show, an international mail art exhibition, I have several works in right now (until 3 Feb 2013) in Lindenfels, Deutschland. 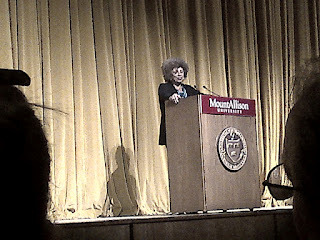 On 27 Sept 2012, Angela Davis spoke at Mt Alison University, Sackville, NB. 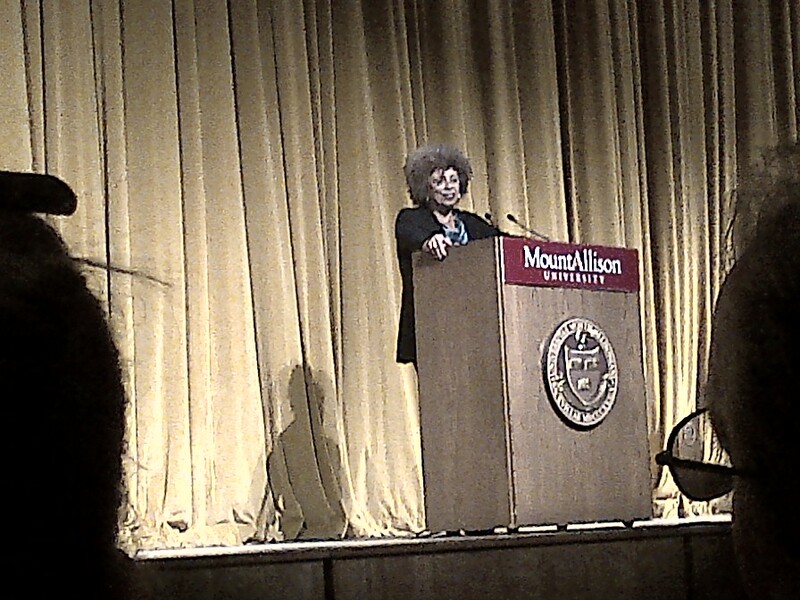 Last night, 27 Sept 2012, Angela Davis spoke at Mt Alison University, Sackville, NB. Not surprisingly, it was her first time in Sackville ... a long way from San Francisco. Her talk, with many references to Canada and activities here, was about global citizenship and the prison–industrial complex, immigrant rights, and the global dimensions of racism—especially with regards to Palestine, "the largest open-air prison in the world. 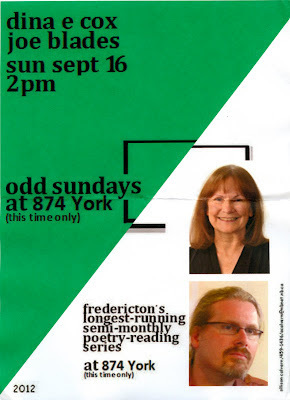 Odd Sundays reading featuring poets Joe Blades and Dina Cox. Recorded 16 Sept 2012 in Fredericton. Zorras: "Doctor says + Crazy"
Found at 3:30 pm, Tuesday, 25 September 2012, outside the guardhouse off Carleton Street in the Historic Garrison District, Fredericton, NB. 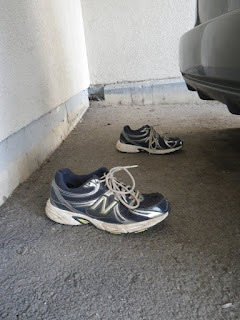 Found 6:48 pm 2012-09-20 in Tilley Hall Auditorium, Rm 102, UNB Fredericton, Fredericton, NB. "Ryan N.B. Canada Sept. 1987/ birthday cake made by Agnes." Joe Blades @ Odd Sundays!!! Our summer break is over, and this Sunday, September 16, at 2pm, marks the first odd sundays event of 2012-2013. For this event only, we are meeting off site, at Unitarian House, 874 York (just down from Montgomery). (Molly and Darrell will have their hands full with Harvest Jazz and Blues folk.) Along with poetry and perhaps some short prose from the open set, coffee and sweets will be served. In order to respect this new and temporary shared space, a donation box will be available for those who wish to contribute. Bring your ears; bring your literary sensibilities; bring a few minutes of your own writing for the open set. Our double feature includes poet Dina E Cox, from Ontario, and poet and publisher Joe Blades, from Fredericton, providing a great way to start our season (see bios below). I hope to see many of you out, and extend a particular invitation to high-school students, whereas they do not need a parent or guardian at this venue. 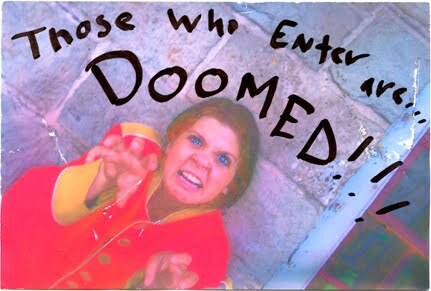 Dina E Cox was born and raised in Saint John, N.B. A graduate of the University of New Brunswick, she taught at Fredericton High School before moving to Ontario with her husband. There they raised a family of four, and will soon be welcoming their ninth grandchild. Dina returns to New Brunswick on a regular basis for inspiration. Dina’s poetry has been published in various journals and anthologies in Canada, Ireland, the United States and Bulgaria. Also a musician and an occasional freelancer, Dina writes both lyric poetry and the shorter Japanese forms, and is a past winner of the Betty Drevniok Award for haiku, Canada’s premier award for English language haiku. Small flames, published with Signature Editions (Winnipeg) in spring 2012, is her first book. Joe Blades is the author of seven books including Casemate Poems (Collected) (Chaudiere Books), and Prison Songs and Storefront Poetry (Ekstasis Editions). He is also publisher of Broken Jaw Press and producer—host of Ashes, Paper, & Beans: Fredericton's Writing & Arts Show (CHSR 97.9 FM, Wednesdays at 5pm). Joe has been writing and promoting writing for decades, contributing widely and deeply to Canada’s literary landscape. Suparna Ghosh: "Dots and Crosses"
Lone Cloud: "I Lost My Talk"
Radio Free Vestibule: "Froo Froo the Talking Cat"
Sheri-D Wilson & Russell Broom: "Spinsters Hanging in Trees"
Mary Elizabeth Grace: "Madda Madda Rose"
Paul Dutton: "Vive le (for Henri Chopin)"
Steven Ross Smith: "Two Kinds"
Tanya Evanson: "The Source", & "Human Clay"
R.C. Weslowski: "i've been thinking/it's about time"
Casemate Poems: Unique Talent Provides Perspective on the World Around Us by Patrick Connors in newz4u.net. 31 July 2012. Photo by Joe Blades (2012) © CARCC. By invitation, Joe Blades will be participating in PICTURES & WORDS: A SUMMER VOICES 2012 EVENT wherein he will give author readings and promote his books. He has had three new poetry books since December 2010. He has never done author readings in Western Newfoundland, only in Labrador and St John’s, so this is a great opportunity. Page One, a writers’ group in Western Newfoundland that has been promoting writers and other creators since 1987, has extended an invitation to him to participate in their annual Summer Voices Program. 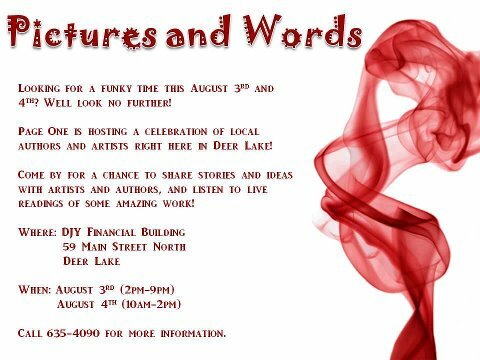 This year, at their closing event in Deer Lake (up the Humber River near Corner Brook), they are hosting a gathering of publishers, authors and visual artists in a two-day event on 3–4 August 2012. The general public is invited to the event. There will be scheduled readings and at the conclusion of the event, Page One will have authors and audience share their work and partake in refreshments. This inter-genre event will hopefully the first of an annual series. 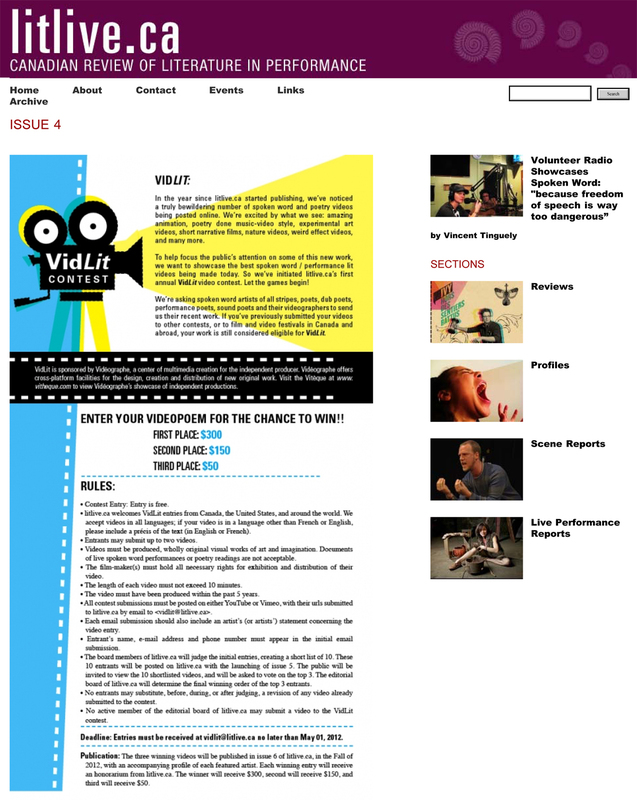 Page One has confirmation of participation from several publishers, authors, and visual artists but do not yet have a schedule [it might show up on Facebook, we hope]. They say they will enjoy having Joe Blades as one of their participating authors and as a representative from New Brunswick. Another example of my writing on the spot, more than just an observer making fieldnotes in my journal. 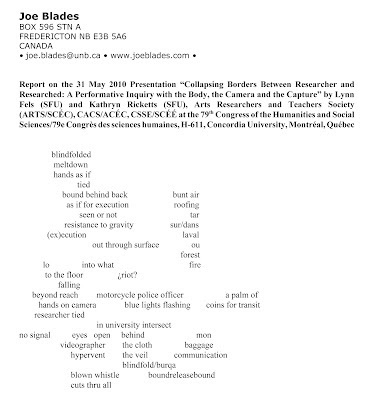 This has since appeared, been reproduced in Kathryn Ricketts' PhD dissertation "The Suitcase, the Map, and the Compass: An Expedition into Embodied Poetic Narrative and Its Application toward Fostering Optimal Learning Spaces" (defended Spring 2011, Simon Fraser University) without acknowledgement of me as its author. 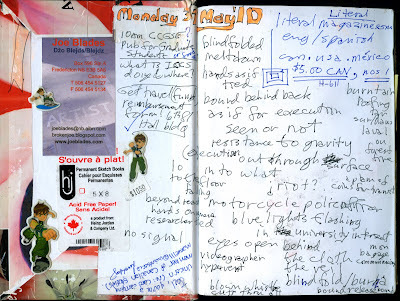 Rather it is presented as "an action poem written by a workshop participant from a conference in Montreal in 2010" (p. 237). I am so not an anonymous "workshop participant" and author. The way she presents it in her dissertation I am not cited or referenced, not even as author of an unpublished manuscript and it appears that she claims copyright on my writing (and I cannot condone or allow that to happen. Thankfully, I have my journal with the untitled original, first draft, handwritten by me. witnessed this evidence when i rolled into the carport of the compartment built on my bike after a long solo artist day in a casemate ... so close to home ... sneakers left behind, laces tied, facing the hatchback (closed) ... so he must have been take before opening, or after closing, the hatchback ... and just like that ... gone! I will write poetry live with manual typewriter, will exhibit them in the casemate & on my blog brokenjoe.blogspot.com and I will make hand-bound books on site and, possibly, commit a poem painting. 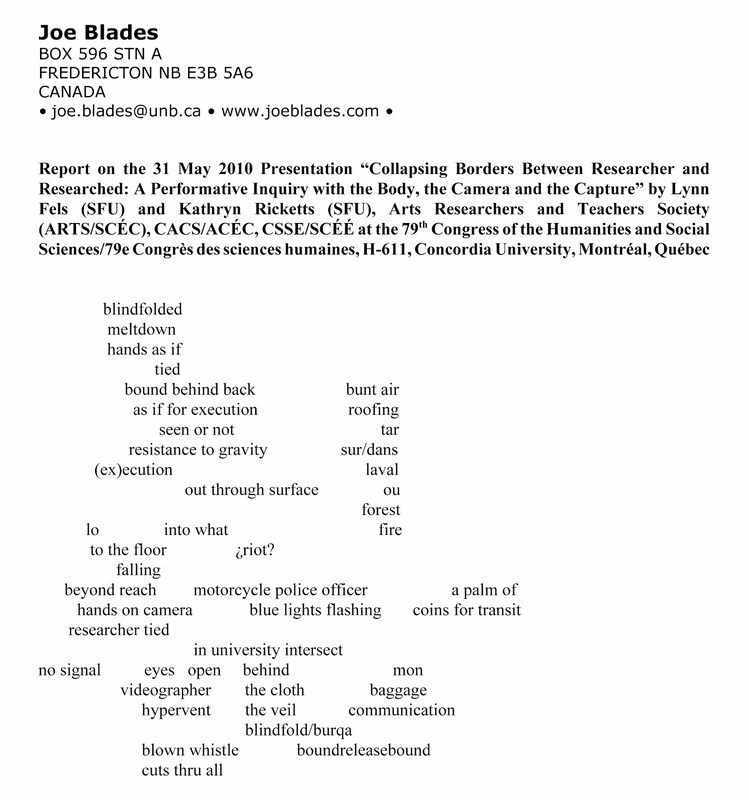 Joe Blades lives in Fredericton, NB. He is a visual artist–writer, producer–host of the 17-year-old Ashes, Paper & Beans community radio program at CHSR 97.9 FM, a member of the editorial boards of revue ellipse mag and ATKA: A Journal of Canadian Studies (Romania), founding publisher of Broken Jaw Press, and a Past President of the League of Canadian Poets. 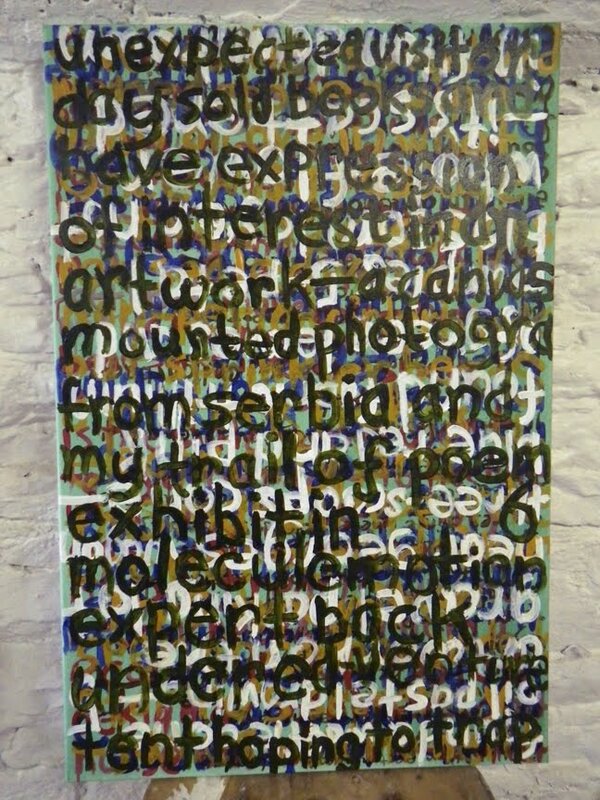 His recent solo exhibition was Trail of Poems in Galerie Charlotte Glencross Gallery. The editor of ten collections, and the author of seven poetry books, including Prison Songs and Storefront Poetry(Ekstasis Editions, 2010) and Casemate Poems (Collected) (Chaudiere Books, 2011), his newest book, Iz knjige koja se ne zatvara, is translated by Tatjana Bijelić and copublished by Art Print in Banja Luka, Bosnia and Herzegovina, and Broken Jaw Press, in Fredericton, NB. Joe Blades will be sharing the FAA casemate 14-20 July 2012, with André Thériault in the Artists in Residence 2012 Summer Series. Soldier’s Barracks, Historic Garrison District, Queen Street, Fredericton. This is a project of the Fredericton Arts Alliance, Fredericton, NB. 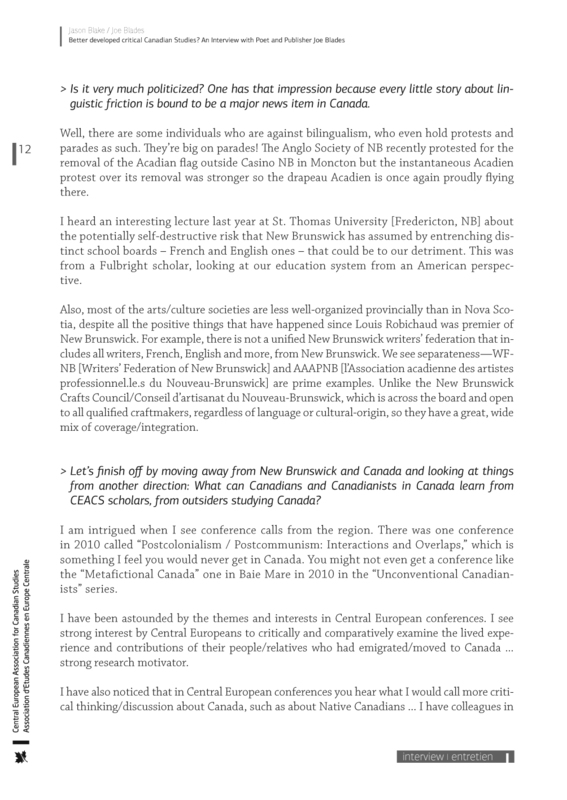 Retired UNB professor John Thompson on Academic Freedom. A presentation of AUNBT and CAUT, 22 March 2012. Jack Layton: Arts and Action is springing to life! This project is an opportunity to reclaim and renew the Canada we love... We especially need all the pre-orders we can round up, to support the publication! Please pre-order from Quattro Books: details and more information on http://www.quattrobooks.ca/fourfront-editions/jack-layton-art-and-action. Editor Penn Kemp is still looking for stories, from a paragraph to a page or two, on encounters with Jack in the many arts and cultures that intrigued him. She is also seeking pieces on how Jack has continued to influence our lives and our activism; how his spirit has stayed with people since his death last August. Jack inspired her personally to move from performance poet to poet activist. Like so many others, she still strongly feel his motivating spirit inspiring this book project in particular! His support of, and interest in, arts and culture in Canada underlay his politics. Throughout his long municipal and federal political life, Jack welcomed and encouraged everyone to become an activist to effect change. Hence, this book for him! Olivia Chow endorses this work, as does his family. She writes: "I heartily encourage folks to send Penn your stories of Jack's relationship with, and his support of the arts. This project is a great opportunity to share our stories about how Jack and the NDP celebrated our Canadian cultures and what we must do together to continue this great relationship. You know he loved to make music and we loved to dance!" Let us reclaim, restore and rejuvenate the Canada we love! Penn Kemp's main aim in Jack Layton: Art and Action is to encourage folks not to abandon politics but to keep positively proactive just as Jack did. He was a strong supporter of our many Canadian cultures that offer us such diversity and perspective. As Jack would say, Never turn down an opportunity to serve! 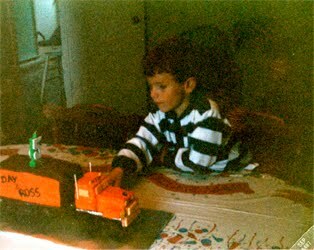 Penn first met Jack when she lived on Toronto Island through the Seventies, fighting City Hall to "Save Island Homes". Fifteen years ago, she became part of his extended family: her husband's brother is married to Jack's sister Nancy. Jack warmly welcomed Penn with his customary inclusivity. She called him my outlaw; he called her sister. Arrangements are being made with the well-respected publisher, Quattro Books, to produce the book. Appropriately, Quattro Books is a publisher that wishes to reflect the unique cultural character and dynamism of Canada now: what it has been and what it is in the process of becoming. Quattro will produce a book of about 150 pages, including photographs, in time to celebrate May 2, the anniversary of the New Democratic Party becoming the official opposition. Penn Kemp will finish collecting material for the book by August 31 and then edit it, with Allan Briesmaster, editor at Quattro. The list price will be $25 per book but pre-orders are only $20. They will be available early next spring from Quattro. The project hinges on having a means of ensuring that the production costs would be covered: one way of financing would be through pre-ordering copies. An alternative would be monetary contributions from individual sponsors. Quattro will retain copies which could be ordered directly by bookstores and by the public through their distributor, LitDistCo. A webpage with more information on Jack Layton: Art and Action is on http://www.quattrobooks.ca/fourfront-editions/jack-layton-art-and-action. Thanks for celebrating Jack’s ongoing influence! For pre-orders please contact Quattro Books, 382 College St., Toronto ON M5T 1S7; www.quattrobooks.ca. Email: info @ quattrobooks.ca. Ph: 416-419-3541 (till August), 647-748-7484 (from 1 August 2012). 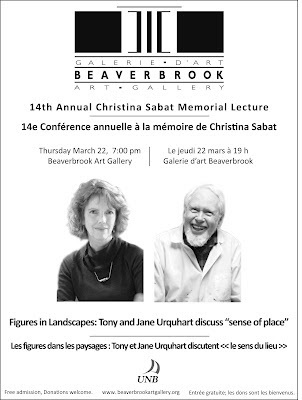 Presented by the Literary Translators’ Association of Canada. Jo-Anne Elder interviews David Homel. Mezzanine, Delta Beauséjour, Moncton, NB. Verbomotorhead: "Monks of the Holy Throat"
A copy of the project with report is available in Marshall d'Avray Hall, Room 226, UNB-Fredericton. The abstract is attached hereto. In this project with report I employ a qualitative research methodology, arts-based autoethnographic research to explore, illuminate and answer my central question: How did I, an artist–poet, become a Canadian Studies practitioner in Central Europe, a translated and published author in Central Europe, a graduate student–learner in adult education, and an adult educator in Central Europe and Canada? My choices for data analyzed include prose, poetry, and photographs by me. My project titled Trail of Poems, a public, off-campus, art gallery installation–exhibition and writer-in-residence performance, is arts-based research in action. 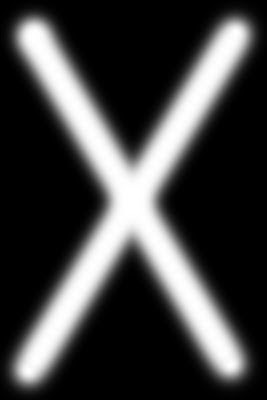 I reflect on the significance my experiences may have for others. My findings include critical insights, limitations, and future research considerations for myself and others. 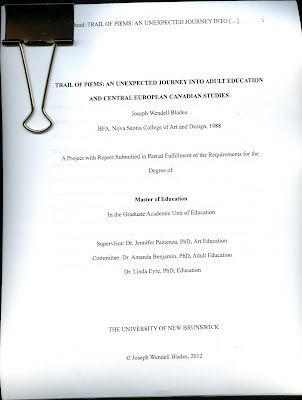 I identify outdated binaries and gaps in adult education theories and practices generally and in arts-based adult education particularly, as well as gaps in Canadian Studies literature in Canada and Central Europe. Click Against the elimination of the "Understanding Canada" program - Contre l'élimination du programme "Comprendre le Canada" Petition | GoPetition and sign! 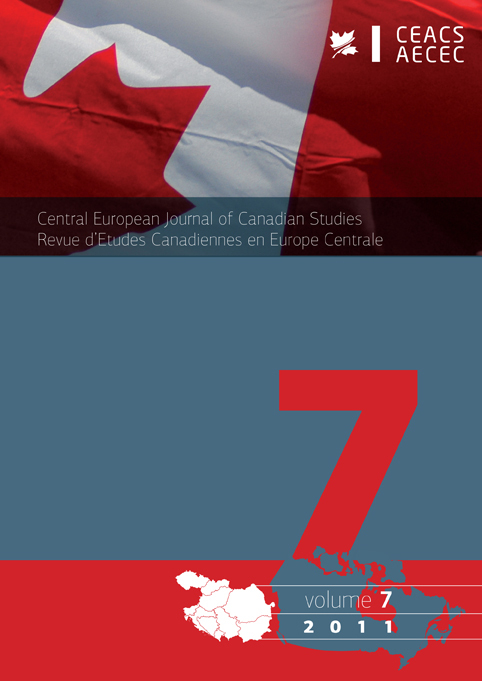 This program has been essential in supporting the work of many colleagues in Canadian Studies---especially ones I work with in Europe and South America. It has supported me, my research and several conference presentations. Author/Writers: David Bidini, Véronique Drouin, Riel Nason, et Mara Tremblay. 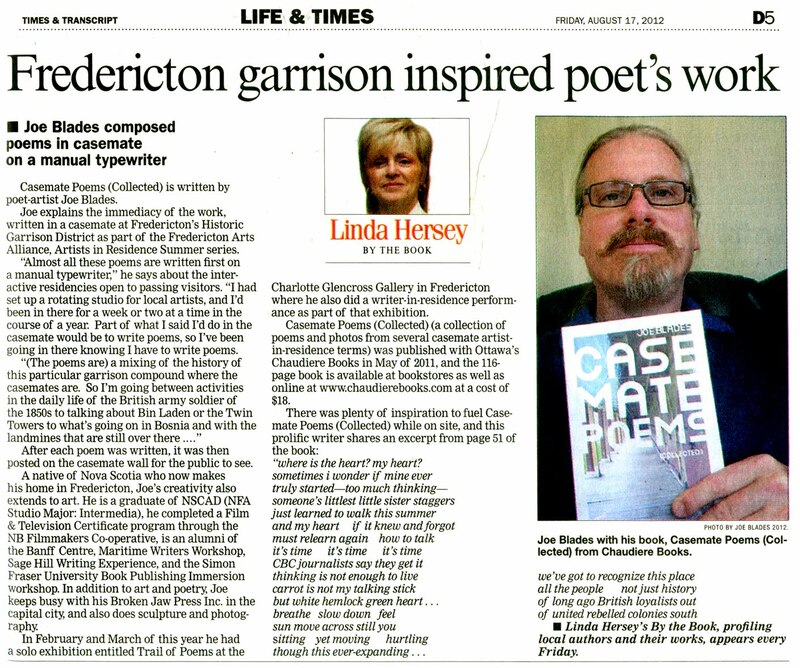 Anita Lahey, poet; Hugh Thomas, poet (recorded at Odd Sundays at Molly's, Fredericton, NB on 18 mars 2012). 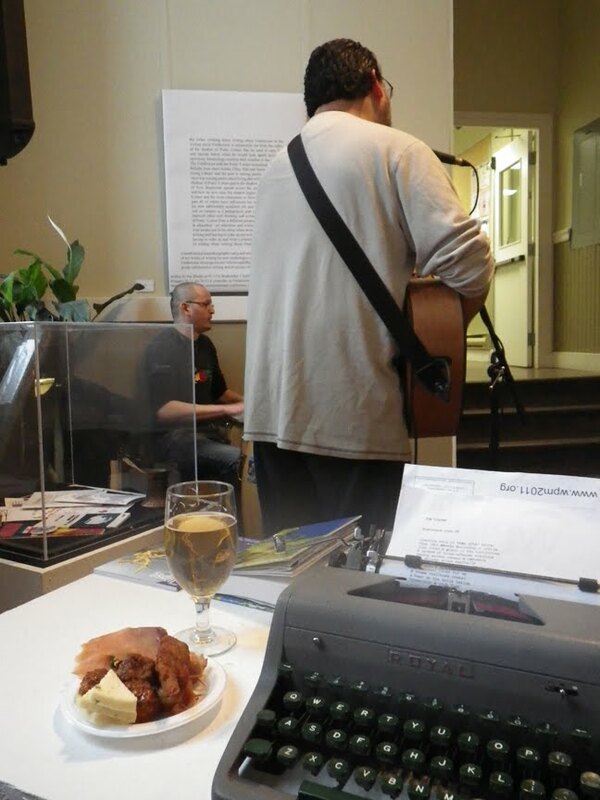 Gerry Shikatani: "Wish (for bp)"
Christian Bök: "Motorized Razors" + "Ubu Hubbub"
Clive Holden: "Trains of Winnipeg"
Joe Blades has been giving readings, performing and publishing his poetry since 1980. Blades was born and raised in Nova Scotia. He's a graduate of NSCAD (BFA-Studio Major, Intermedia, 1988). He completed a Film & Television Certificate Program through the NB Filmmakers' Cooperative in 2008, and currently is finishing a Master of Education at the University of New Brunswick. He is also an alumni of the Banff Centre, Maritime Writers Workshop, Sage Hill Writing Experience, and the Simon Fraser University Book Publishing Immersion Workshop. His poetry and art have appeared in over 50 trade and chapbook anthologies and CDs, and in numerous periodicals. 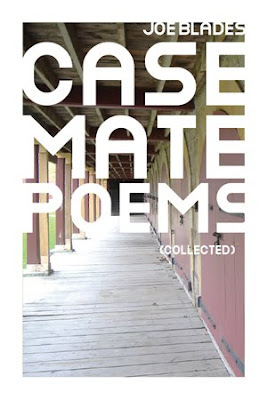 Blades has authored or edited 30 poetry chapbooks and limited edition artist books. His seven full-length poetry books are Cover Makes a Set(SpareTime Editions, 1990), River Suite(Insomniac Press, 1998), Open Road West (Broken Jaw Press, 2000, 2001), Casemate Poems (Widows & Orphans, 2004), from the book that doesn't close (Broken Jaw Press, 2008), Prison Songs and Storefront Poetry (Ekstasis Editions, 2010) and Casemate Poems (Collected) (Chaudiere Books). Serbian-language translations of River Suite as Rečna svita in Slike iz kanade: Tri kanadska pesnika (Niš: SKC Niš), and Casemate Poems as Pesme iz kazamata(Belgrade: i.p. Rad), were published in 2005, with from the book that doesn't close as Iz knjige koja se ne zatvara (Banja Luka: Art Print & Fredericton, NB: Broken Jaw Press) just released in March 2012. Nicholas Lea earned his B.A. from the University of Ottawa. His poetry has appeared in such journals as dANDelion, Qwerty, The Puritan, Ottawater and ditch. His work was also been featured in the Globe and Mail's online books blog, In Other Words. He has worked on the editorial boards of Bywords Quarterly Journal and The Fiddlehead. His debut collection of poetry, Everything is Movies (2007, Chaudiere Books, Ottawa) was nominated for the Lampman-Scott Award. He most recently published the chapbook, Actual Girl(2011, The Emergency Response Unit, Toronto). He lives in Ottawa. 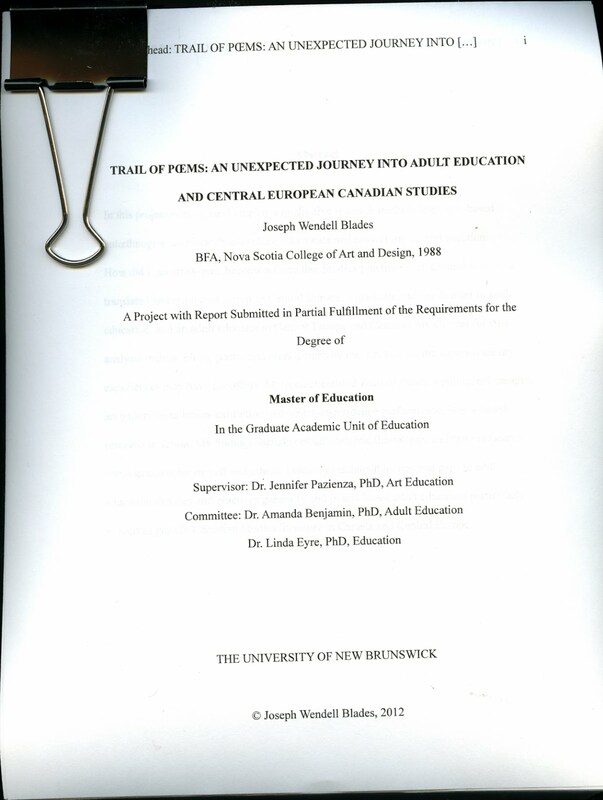 Tomorrow morning I deliver a copy of "Trail of Poems: A Journey into Adult Education and Central European Canadian Studies", my project with 225-page report submitted in partial fulfillment of the requirements for the degree of Master of Education @ University of New Brunswick–Fredericton. Defence is to happen 25 May, in Marshall d'Avray Hall ... details TBA. 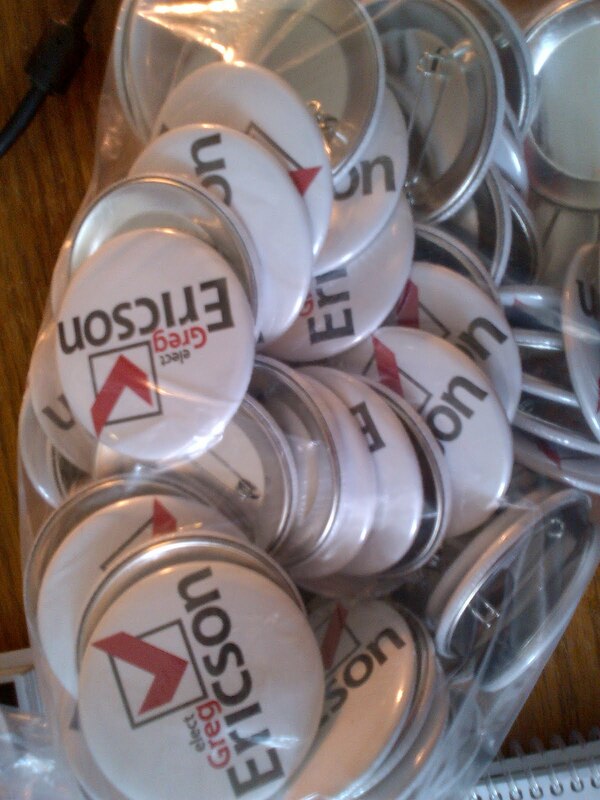 get 100 buttons made for Greg's campaign. Jane Urquhart reading from her novel Sanctuary Line, 22 March 2012 @ UNB. 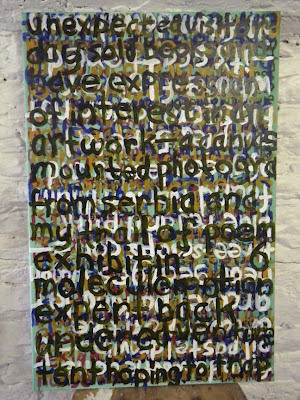 Fluffy Pagan Echoes: Sound Poem. Fundraiser show and sale of artworks for Charlotte Street Arts Centre happening @ Isaac's Way Restaurant, 73 Carleton St., Fredericton, NB. Contact them for details. I've donated a smaller, 16" x 20", framed print of one of my photos from the Trail of Poems exhibition. In April 2011, Jason Blake, of the English Department at the University of Ljubljana, Slovenia, and the new Editor-in-Chief of the Central European Journal of Canadian Studies interviewed me via a Skype video call for 2011's issue 7, for release late in the year. There are two articles by me in the new, finally released, Canadian Review of Literature in Performance, issue 4. Max Middle, Ottawa Poetry Podcast, 2006. Tanya Evanson: "Book of Human Being"
Aural Heather: "Three Blocks West of Wonderland"
CHSR is a non-for-profit campus–community public radio station operated by volunteers and two staff people. To stay on the airwaves, we depend on your support. 10th International Multicultural--Multilingual Poetry Reading & Poster Poem Exposition. Recorded 2010-03-20 @ Gallery ConneXion, Fredericton, NB. MC: Sophie M. Lavoie. Ashes, Paper & Beans: Host: Joe Blades. CHSR 97.9 FM, http://www.chsrfm.ca/ Fredericton, NB. Beth Powning reading from The Sea Captain's Wife. Dracul van Helsing reading John Donne's No Man is an Island. Leonardo de Fincley: Get off your high horse. Edwin Mars doing a few sonnets. Tanya Evanson with four poems: "Blood and Honey", "Slow Man", Dervish Weaponery . Derviş sílahi", & "Living is Nothing". R.C. Weslowski: "how round is round", "love part 3: my heart is a glass pinata", & "as i breathe". to poem writing i go!!! how many poems in a bushel? how many wishes in a sheep? Found at 5:15 pm, Friday, 8 March 2012 on the icy sidewalk outside the Chestnut complex, 440–470 York Street, Fredericton, NB. 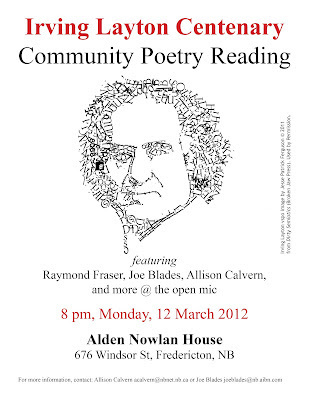 12 March 2012, Monday, 8 pm, an Irving Layton Centenary event in Fredericton. Centenary events are happening across Canada. 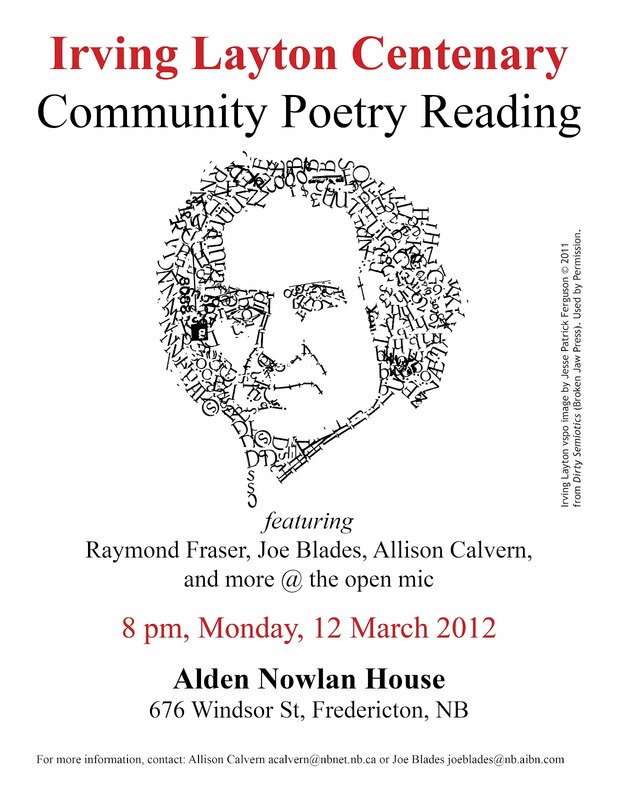 A Community Poetry Reading featuring Raymond Fraser, Joe Blades, Allison Calvern, and more at an Open Mic, will happen at Alden Nowlan House, 676 Windsor St, Fredericton, NB. Everyone is welcome to read their favourite Irving Layton poem or poems for and about him and his writings. Nela Rio, Carlos Morales, Robert Shiplett, & Joe Blades, readers. The better two-thirds: Richard Gloade, esq. & Jaun Morales (plus my food, Keith's pivo, & keys) during the Fredericton Business After Hours on 1 mars 2012. Richard Lemm & Jo Griffith reading at Odd Sundays at Molly's, 20 Nov 2011.
what are skins vs shirts vs suits? aren't you a cylon too?